This week, ask your representative to oppose the House Budget Resolution and instead support a bipartisan budget deal that raises the cap for nondefense discretionary spending and achieves parity. This Action Alert requests that AAS members contact their representative this week to ask that they oppose the House Budget Resolution that recently passed out of committee and instead support a bipartisan budget deal that raises the cap for nondefense discretionary spending and achieves parity. Instructions on whom to contact and how to do so are provided below. We've assembled sample communication templates, as well. A budget resolution is a binding agreement between the House and the Senate that sets the amount of money that can be spent on the discretionary parts of the government. 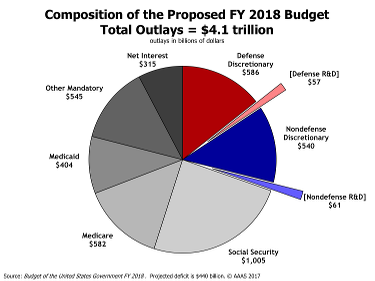 Roughly 25% of the total federal budget is discretionary, and roughly half that is nondefense discretionary. The figure to the right (credit: AAAS) shows the composition of the proposed FY 2018 budget. The wedge labeled nondefense R&D is the part of the federal budget that includes NASA, the National Science Foundation (NSF), the Department of Energy (DOE), and many, many more agencies. When the nondefense discretionary cap is cut, then all nondefense agencies, including NASA, NSF, and DOE, can expect cuts. What's wrong with this budget resolution and what are we asking for? The House Budget Resolution decreases the cap for nondefense discretionary agencies for FY 2018. This is an $8 billion decrease compared to the cap for FY 2017, and a $5 billion decrease compared to the sequestration cap in the Budget Control Act (BCA). When the nondefense discretionary cap is cut, then all nondefense agencies, including NASA, NSF, and DOE, can expect cuts. 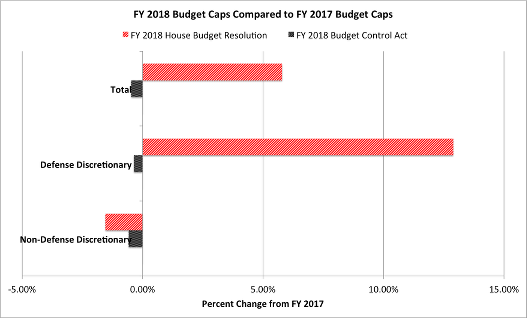 The figure above shows the budget caps from the BCA and the House Budget Resolution compared to the FY 2017 budget caps — 0% on this chart would mean no change from FY 2017. The table below lists the budget caps. We are asking the House of Representatives to reach a bipartisan budget deal that would increase the nondefense discretionary cap and achieve parity between nondefense and defense spending. For additional information on the bill, please refer to the Library of Congress page for the legislative text and the House Budget Committee's website for their summaries. On 19 July 2017, the House Budget Committee passed their Budget Resolution. The next step is for the Budget Resolution to be brought before the entire House of Representatives for a vote. We expect this debate to continue during the congressional break. That makes this the optimal time to communicate our concerns to our representatives. It's important for us to tell our representatives the negative impacts this resolution would have on the science community and to encourage them to support a bipartisan budget deal. What's the difference between this and the appropriations bills? Under "regular order" the budget resolution would have been agreed to before the Appropriations committees started to consider the funding levels for agencies. For many reasons, the budget and appropriations processes have not followed regular order this year, which is why some of the appropriations bills have been completed before a budget agreement was reached. The budget resolution sets the amount of money that can be spent on the discretionary parts of the government. It also sets the amount of money that can be spent on different "functions." The subcommittees within the Appropriations committees determine the funding levels for each agency and for programs within the agencies. 1. Determine who your representative is. customize the sample phone script and call each of your representatives using the phone numbers listed. It is crucial that you customize your message. According to the Congress Foundation’s 2017 study on how Congress members respond to communications, individualized messages and phone calls are about an order of magnitude more influential than form emails (refer to their fig. 1). You may also wish to tweet to your representative. Generally, members will have links on their websites if they are active on Twitter.